Jelly Belly presented by Kenda has announced renewals with both its name sponsor – the Jelly Belly Candy Company – and presenting sponsor – Kenda Tyres – until the end of 2013, which will take the team into its fifteenth year. The other good news for the US-based Continental team is that it has also secured further two-year deals with its technical sponsors Focus Bikes, apparel provider Pactimo, and long-term helmet and eyewear provider Rudy Project. Returning for another season will be cyclocross specialist Jeremy Powers, who has spent his entire eight-year road career with the team. Also back, for their fourth seasons with the team are Brad Huff, Sergio Hernandez, Sean Mazich and Will Dickeson. Joining the team for 2012 will be new riders Scott Stewart from Team Type 1, and Dutchman Ricardo van der Velde, who spent two years at ProTour team Garmin-Transitions before riding for Donckers Koffie-Jelly Belly in 2011. The team is also taking on two neo-pros in the shape of Menso de Jong, from Wonderful Pistachios, and Mexican Luis Enrique Davila. 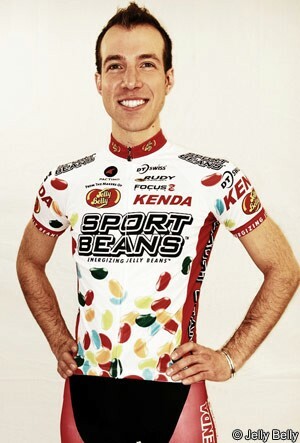 The 2011 season proved to be one of rebuilding for Jelly Belly p/b Kenda, with many of its younger riders moving on at the end of 2010. “We could have used more climbers and time trial specialists in this year’s roster,” explained Van Haute, so my objective going into next year is to improve those areas.